Infographinomicon: ... you're going surfing on the internet! ... you're going surfing on the internet! While I have to admit it was a bit of a long shot to expect much to come from the #TankTheRewind proposal, I could not pass up the opportunity to get in early just in case. As it turns out, the results were a lot less clear-cut than I expected. 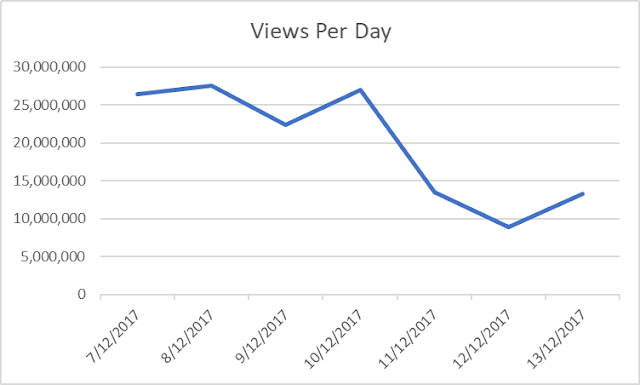 At the time of writing the video has just over one-hundred and sixty-one million views (one-hundred and sixty-one million, three thousand, six-hundred and seventeen to be precise) with 3,209,209 thumbs up and 1,710,565 thumbs down. Wikipedia currently lists it as the 11th most disliked video in history (and 4th most disliked non-music video), but this has not been updated in almost a week and the 2017 rewind has since eclipsed two move videos to become 9th most disliked. 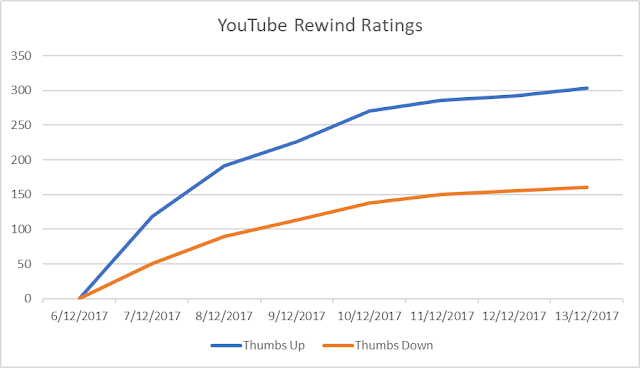 This thumbs up-to-down ratio equates to a 65.2% approval rating, well below the 78.8% statistically significant threshold outlined above; excluding the 2011 data, this year's Rewind has statistically significant disapproval. Previous years' data duplicated from previous post and may be marginally out of date. In fact, even including 2011, the disapproval is highly statistically significant. However, the role of #TankTheRewind in this is probably quite limited. The original video using the hashtag has garnered only 161,780 views--a minuscule fraction of the thumbs-down votes. A search of YouTube for the phrase lists only 4 other videos (1, 2, 3) with view counts non measured in the hundreds or less before suggesting alternate search terms, and one of these (4) has no connection to the hashtag. The three on-topic videos and the original have a combined 396,184. 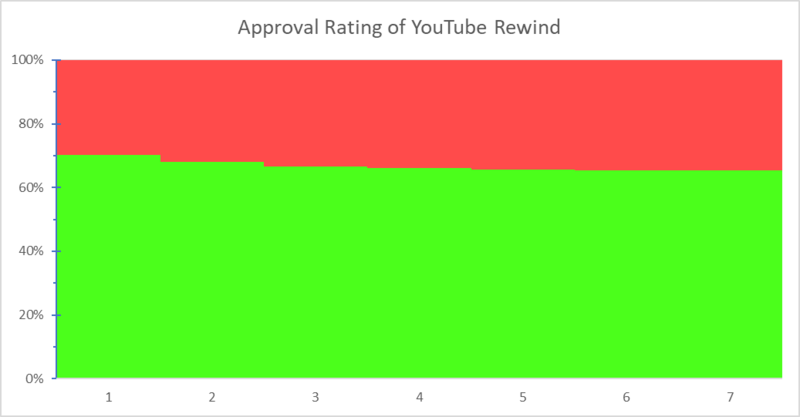 Assuming each view on a video was by a different person (which they would not be), none of these videos have an overlapping audience (which they probably would) and all of those who watched them were motivated to protest (also unlikely) that still only accounts for 1 in 8 down votes. Throughout the week of data collection on the Rewind Video, top comments repeatedly complained about numerous prominent YouTubers being absent and the awkward focus of the video on tragedies, television personalities and out-dated fads. Just today I did find #TankTheRewind posts higher in the comments than any of these, though that may be dedicated TTR supporters lingering long after most viewers have clicked through. 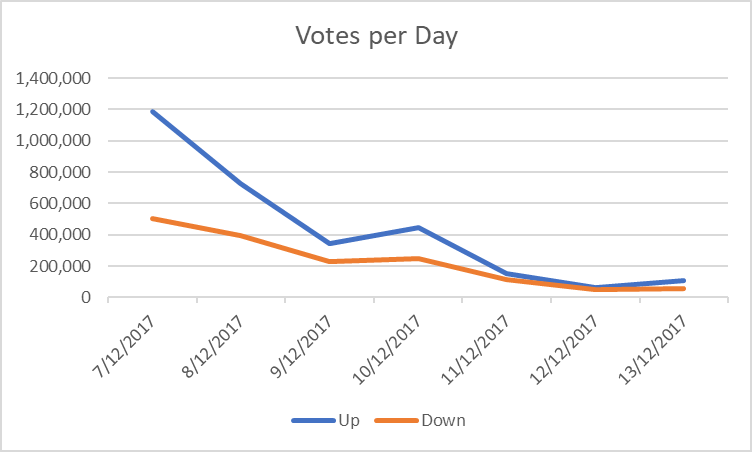 Unsurprisingly, as views declined so did votes, but the favourable votes dropped off much quicker, until almost on par with negative votes. 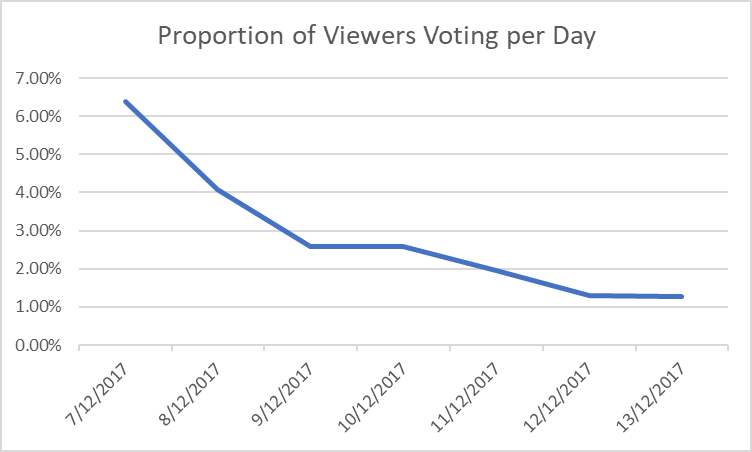 Interestingly, the number of viewers casting a vote dropped of dramatically too, possibly due to repeat viewings of the video. 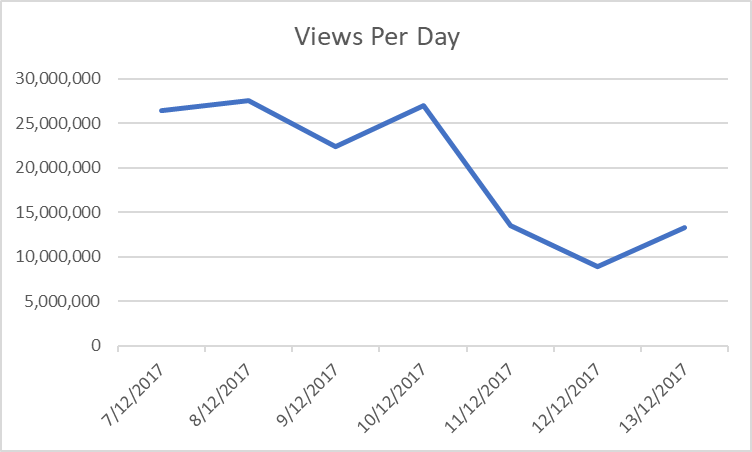 All of this tends to suggest an early support for the video which reduced over time. 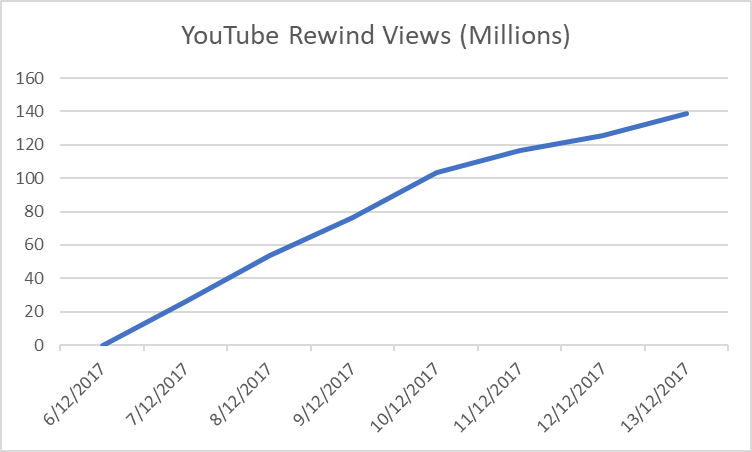 This would be consistent with people changing their votes as the #TankTheRewind movement became more prominent, but could also be the result of peer pressure, a die-hard rewind fandom that jumped in early or other phenomena. There is no real way to separate the real causes of the voting trend, but it would seem that support for the video is not independent of when it was viewed. That, in itself, is interesting.